Andreas Rimner delivers radiation to lung cancer patients using a GPS-type approach that tracks the tumor’s precise location at all times. Radiation therapy for lung cancer is challenging, but MSK radiation oncologists are testing a system called Calypso® GPS for the Body that continuously tracks the location of lung tumors at all times. The system causes radiation to automatically shut off if the tumor moves outside a very small field. This spares healthy tissue from receiving radiation and allows higher radiation doses to be used safely. Lung cancer requires especially precise radiation treatment. MSK doctors are testing a GPS-type system to guide radiation. The system uses tiny markers implanted near a tumor. The markers act as beacons to track the tumor’s location. If the tumor moves, radiation instantly shuts off. Radiation therapy is a highly effective treatment for lung cancer, but it can be challenging to deliver consistently to lung tumors, which move as a patient breathes. To make this treatment more precise, Memorial Sloan Kettering radiation oncologists are testing a sophisticated positioning system using tiny markers that are implanted in the lungs and act as beacons. The markers signal to a tracking system made up of an antenna plate hovering over the patient and three cameras installed in the ceiling of the treatment room. The markers produce a 3-D representation of the tumor’s location at all times. MSK is among a handful of centers performing the first clinical trials for lung cancer testing this system. The technology has been used for years with great success to treat people with prostate cancer, and it is already approved by the FDA for use in several other locations in the body. As a patient breathes, the lungs expand and contract, which makes the tumor a moving target and increases the chance that the radiation may miss the cancer cells and damage normal tissue. The tumor-tracking system, called Calypso® GPS for the Body, continuously monitors the tumor’s location during the treatment session. If the tumor moves outside of a very small field — like when the patient breathes — the machine delivering the radiation automatically switches off, preventing healthy tissue from being damaged. It operates the same way satellite-based GPS pinpoints a location on earth. “We’re pleased to be giving our patients access to this technology, which is otherwise not available prior to FDA approval,” says Dr. Rimner, who is leading one of the trials. 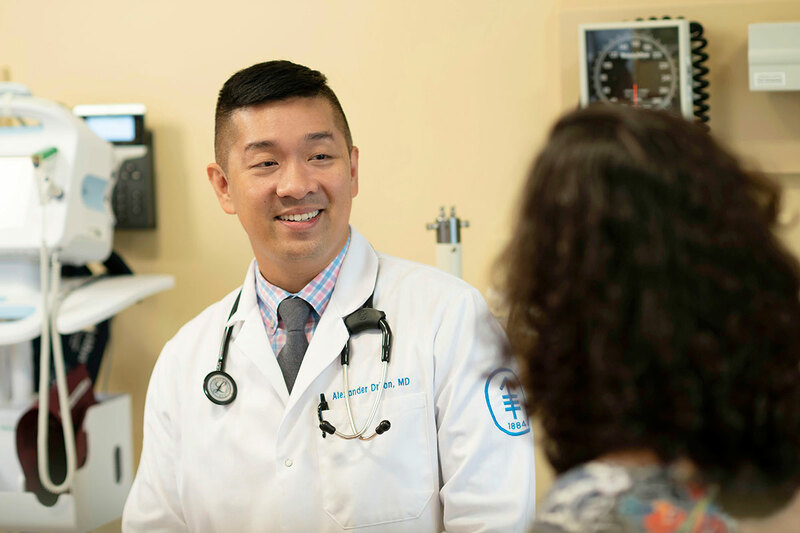 The studies are enrolling patients at several MSK locations, including Memorial Hospital; MSK Commack, on Long Island; and MSK Westchester. Despite the approach’s clear success in other cancers, its use in lung cancer was not feasible until recently, after the Calypso company (now part of Varian Medical Systems) designed markers that wouldn’t become dislodged. The markers are investigational and not yet on the market in the United States. To set up the system, doctors implant three of these very small (14 millimeters by 2 millimeters) markers near the patient’s tumor during a bronchoscopy procedure while the patient is under anesthesia. 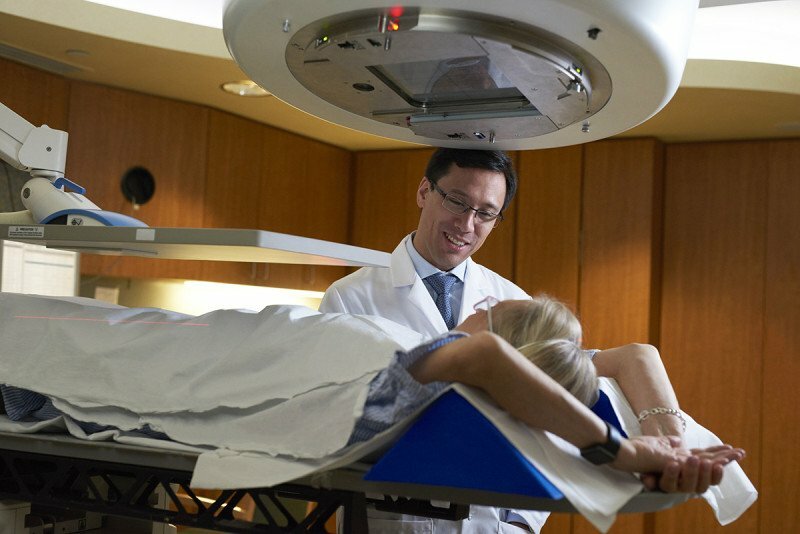 Radiation oncologists then define the target and work with medical physicists, who design the best way to execute the treatment plan — carried out later — using mathematical modeling and advanced computer programs. In addition to minimizing damage to healthy tissue, the precision of the GPS approach facilitates the use of higher radiation doses. “With this system, we have seen increases in our ability to deliver a higher radiation dose of up to 20%, which in many cases makes a big difference in controlling the tumor,” he says. One trial, led by Dr. Rimner, medical physicist Michael Lovelock, and pulmonologist Robert Lee, tests the Calypso system in combination with a technique called Deep Inspirational Breath Hold (DIBH). The DIBH method requires the patient to hold his or her breath for about 20 seconds while the radiation is being delivered, with the intent of keeping the tumor in the same spot. This technique also moves healthy lung tissue away from the diseased portion to be treated — much like the surface of an inflated balloon — and pushes organs such as the heart away from the target site. A second trial, led jointly by medical physicist Gikas Mageras, Drs. Rimner and Lovelock, and pulmonologist Mohit Chawla, is testing the Calypso system during treatments when the patient breathes normally, with the radiation switching on and off depending on the tumor’s location. This provides an option for patients who are unable to hold their breath for a sustained period. Although the results of both trials have not yet been fully analyzed, Dr. Rimner says he and his colleagues are pleased with how the Calypso system has been working and are hopeful about its prospects. “Knowing that this approach has already shown to be safe and effective in other cancers, we’re optimistic it will be incorporated into radiation treatment for lung cancer patients in the near future,” he says. Keep up the great work . The rest of the world relies on your advances . Thanks for the encouragement, Gina! The technology advances continue to amaze in the fight against cancer. Will this system work with multiple small 2 mm lung nodules. Hi Art, we sent your question to Dr. Rimner, who replied that the system may work with multiple small lung nodules, but it depends on their location, geometry and other anatomic factors. Thank you for your comment.